Top-100 Japanese tennis player Kei Nishikori has added Brad Gilbert, one of the game’s most sought-after coaches, as his new traveling coach and mentor, for the 2011 season. Kei Nishikori will be expanding his IMG Academies coaching team with a consulting role for Brad Gilbert. Gilbert is currently a guest coach at the Bradenton, Fla.-based IMG Bollettieri Tennis Academy, where Nishikori trains year-round under the tutelage of legendary coach Nick Bollettieri and his world class staff. A fierce competitor, Nishikori ended his 2010 season with one goal in mind – to make 2011 his best season of record. To help him achieve this, he has sought assistance from Gilbert, the man Andre Agassi relied on for nearly a decade, coaching him to six Grand Slam titles between 1994 and 2002. Gilbert has also coached Andy Roddick and Andy Murray. Said Gilbert, “Kei is a fierce young competitor. He knows what he wants from the game of tennis. I’m excited to expand my relationship with the IMG Bollettieri Tennis Academy and help consult Kei during the 2011 season.” Both Brad Gilbert and his sister Dana Gilbert were students at the IMG Bollettieri Tennis Academy in the 80s. “I am excited about the addition of Brad to my team. Brad’s knowledge as a former top player, as well as his coaching success, is something that can help me become a better player,” added Nishikori. 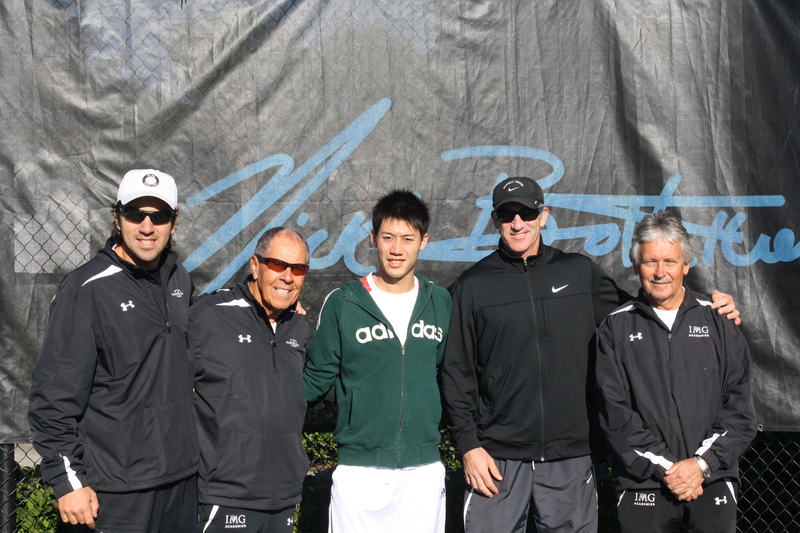 In the 2011 season, Nishikori will travel full-time with IMG Bollettieri elite coach Dante Bottini. Bottini is a long-time member of Nick’s elite coaching staff. Nishikori returned to play in February 2010 after a year-long lay-off following elbow surgery. He won consecutive ATP Tour Challenger series titles at Savannah and Sarasota in May, before playing in his first French Open shortly thereafter. By summer’s end, the 20-year old advanced through to the third round of the U.S. Open, posting his best Grand Slam finish since 2008. For more on Kei, you can find him on Facebook! ~ by Nick's Picks on December 21, 2010. Brad coaching news excites Japan’s tennis fans. I have watched all Kei’s matches of US Open in 2008 and 2010. He is an aggressive talented player but I think he needs more focus and mental coolness at the crucial moment (he often throws points away). I think Brad is an excellent choice for Kei as he is a good listener. Brad can give him a lot of tips how to play mental games like he did to Agassi.